Space issues, very damp environments, old fireplaces to be reconditioned, ceilings that are either too low or too high: these are limit situations for which a brilliant solution was found with the installation of a pellet product. Let's see five actual cases, that will hopefully give you new inspirations. In this first case, there were two main restrictions. Firstly, the layout of the room, which was definitely long and narrow, where we had to fit the kitchen furniture – a wide dining table and a small living room/hall. 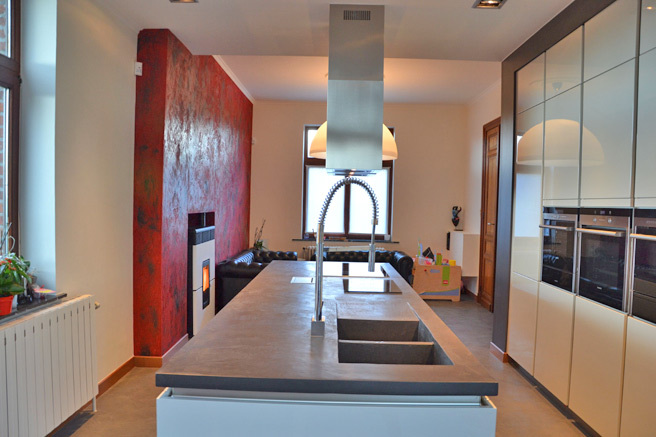 Secondly, the presence of an old flue, incorporated in a small plasterboard wall, which separates the kitchen from the living area, both for aesthetic and functional reasons. The solution. Philo pellet stove by MCZ. In addition to a very reduced depth (just 28 centimetres), Philo has the flue outlet at the top instead of at the back and is therefore perfect for installation in a niche. It doesn’t take up more space than a radiator and the flow of hot air can be adjusted so that it comes out from above or from the front. Case 2. Drying up the room and heating three rooms at the same time. The first requirement was to provide a suitable heating system for a big, rather damp and cold house. The second requirement was to heat the living area and the sleeping area with just one product, though with the option of choosing the temperature and ventilation autonomously. The solution. Tube Comfort Air® ducted stove by MCZ. With Tube you can heat the room whilst pleasantly drying it up. 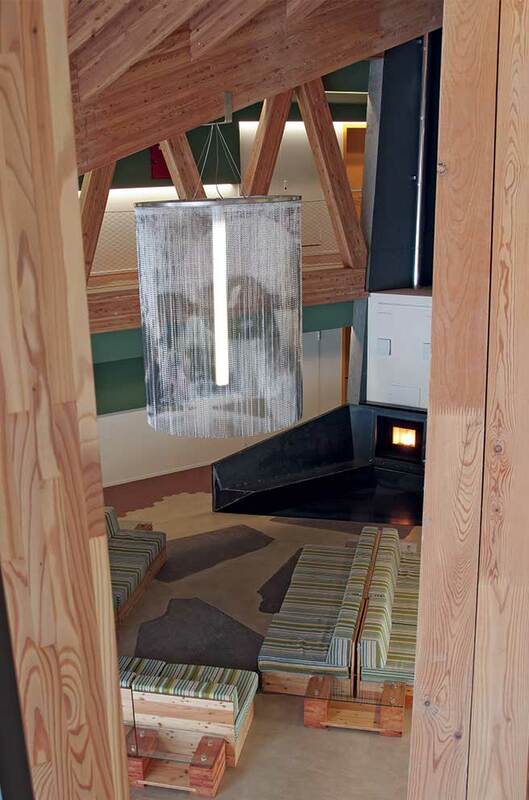 Thanks to the wall-mounted ducting, the hot air also reaches the two bedrooms on the second floor. The temperature and ventilation of each room can be autonomously adjusted as required simply with a remote control. Case 3. Silence and comfort to work with peace of mind. When working in front of a computer, you need a warm, cosy and yet silent environment. In this case the requirement was to find an efficient and user-friendly stove to heat the open space of a graphics studio, with very high ceilings, created after renovating an old country house. The solution. "Cute" stove by MCZ. Two "Cute" stoves were installed in the studio. They are programmed to start off on their own before my colleagues arrive and turn off when they have left. With the “No-Air” function, they turn on even if the fan is off and ensure extremely quiet operation. 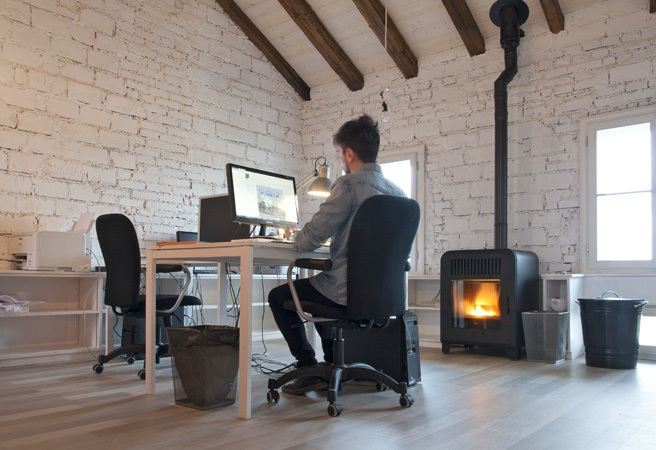 Finally, a key aspect is the gentle and natural flame that recalls a wood-burning one, thereby making the working environment cosier and more pleasant. In this case, there was the need to find a more economic solution to heat the system and domestic water of an old farmhouse, with medium-low insulation and heated with an expensive and quite polluting diesel boiler. It was important to find a solution we could use not just in winter, but in summer as well. The solution. 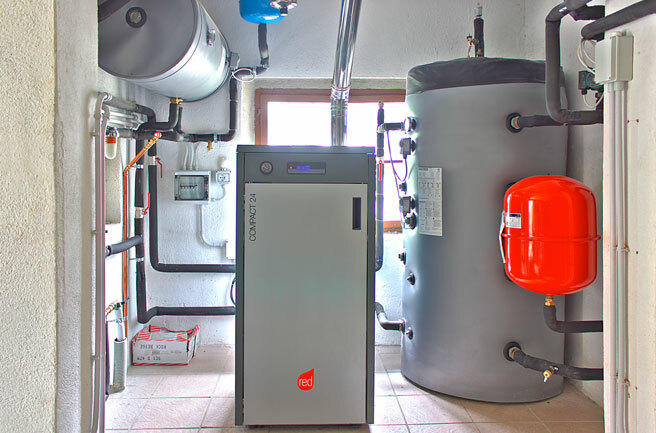 Compact 24 pellet boiler by Red. Considering the need to continuously use the heat generator for 365 days a year, in this case the boiler was much more suitable than a stove. Installed in the dedicated compartment, the boiler can also be used in summer for domestic hot water without the risk of overheating the room. The large central foyer of this hotel, with ceilings more than eight meters high, is the connecting point of all the rooms. The wide space and especially the tendency of heat to rise and concentrate on the landings of the upper floor called for an additional heat source. The solution. Vivo 80 Comfort Air® Pellet Fireplace by MCZ. With the fireplace, installed right at the junction of the main axes of the roof, we are able to reach the ideal temperature, though it also added a more comfortable and a cosier feel to the entire space. Guests leaving or returning from excursions are more willing to stop to enjoy the warmth of the fire before going back to their rooms. Choosing the pellet version means you can program on/off times according to when clients stay for longer in the hotel. Staff is only involved once a day and for maximum five minutes to reload and clean the brazier.